Today being Palm Sunday, the Supreme Executive Committee is focused on palms, processions, readings of the passion of Jesus, and so on. However, we also can’t escape the fact that tomorrow begins the showdown in the Faithful Four. Bright and early tomorrow morning, both Mary Magdalene and Margaret of Scotland will compete. Only one will emerge, ready to enter the championship match on Wednesday. After lots of kitsch last week — and a little bit of, um, kontroversy — we thought we’d encourage a more reverent contemplation today. As many of you know, Forward Movement (the sponsor of Lent Madness 2012) publishes a book called Calendar of the Saints: Lent Madness 2012 Edition. It’s a set of devotional essays for every saint in the official calendar of the Episcopal Church, plus the saints who made it into the bracket of Lent Madness this year but who aren’t yet officially commemorated. There are plenty of places to get facts and narrative hagiographies. These brief essays are intended for private devotional use, and they tend to focus on one aspect of the saint’s life which can be applied to our own. Each entry concludes with a prayer. Here are excerpts from the two essays for Margaret of Scotland and Mary Magdalene. Later today we’ll post the entries for Tuesday’s contentants, Emma of Hawaii and Dietrich Bonhoeffer. [Margaret] was always a deeply religious person, showing great interest in the church and great compassion for the poor. In her youth she considered a religious vocation and in her maturity she found one, as wife and mother. 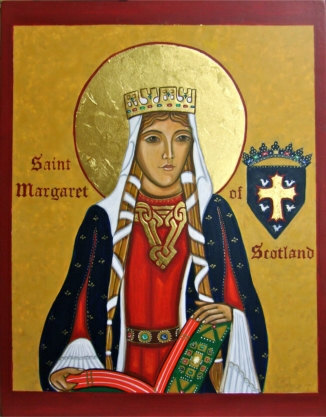 Her firm and loving influence on the king, the church, her children, and the people, virtually renewed the life of the whole nation of Scotland. Under her influence monasteries, schools, orphanages, and hospitals were founded and the quality of life greatly improved in the land. One tragic aspect of Scottish life about which Margaret could do nothing was that of clan warfare and blood feuds. Malcolm was treacherously slain at Alnwick in 1093 and the grief-stricken Margaret died a few days later. Their son, David, became one of Scotland’s finest kings. Their daughter, Matilda, married the English King Henry I, and so Margaret and Malcolm are ancestors of the present British Royal Family. As you did endue with zeal and charity your servant Margaret, so endue us. Amen. 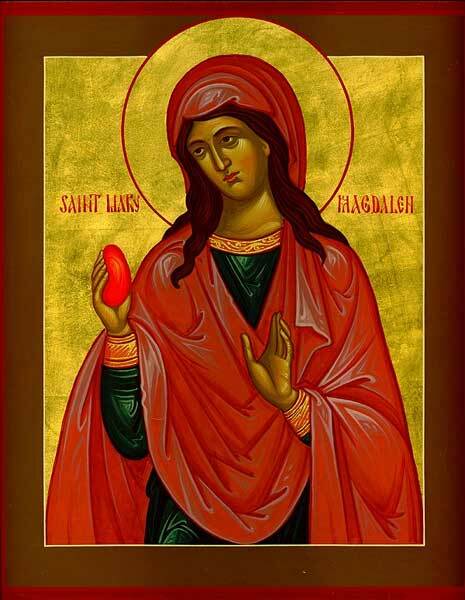 Tradition has held that Mary of Magdala was a very emotional person and our English word “maudlin” derives from her name. She followed Jesus into Galilee and helped care for him and the disciples there. She witnessed the Lord’s suffering on the cross. She took oil to anoint his entombed body and therefore she is often represented with a jar of ointment. Her tearful reaction on finding an empty tomb is still a favorite line to many faithful, “They have taken away my Lord, and I do not know where they have laid him” (John 20:13). When the Lord appeared and called her name, “Mary,” she recognized him and exclaimed, “Teacher!” She was the first to see the risen Lord. By the way, for only seven bucks you can get your own copy of Calendar of Saints: Lent Madness 2012 Edition. It’s available as an ebook only for Kindle and Nook. 9 Comments to "Devo with the Faithful Four, Part I"
I have it on the Kindle and I love it! Even better than the old “Saints Alive”. If Mary of Magdala doesn’t win tomorrow, I may have a hissy fit and it is not a pretty sight to see. Readers and commenters take note, also the mighty,mighty SEC. Am I safe in assuming that “Devo” is the short version of devotional and not the musical group DEVO? Well, my cats Meg, Malcolm, David, and Matilda are going to be pretty annoyed if I don’t vote for Margaret — and they’re in a position to cause me much more trouble than you are. I’ll have to think about this!! Aleathia, that is correct. Devo is short for devotional. We like to use hip terms that make us appear to be, well, hip. With palm in hand today I guess you could, to quote the punk band DEVO, “Whip it. Whip it good.” But we’ll leave that to your discrection. Is the saints book available in the kindle app with iPad? I’d love a paper version (but would settle for parchment or vellum)! Kudos to the Supreme Executive Committee! Now, can we have the ebook Calendar of Saints for iPhone? You can download the free Kindle app to your iPhone and read the Saints book on the Kindle app. Ok Yes, I want Mary of Magdala! 1 Trackback to "Devo with the Faithful Four, Part I"